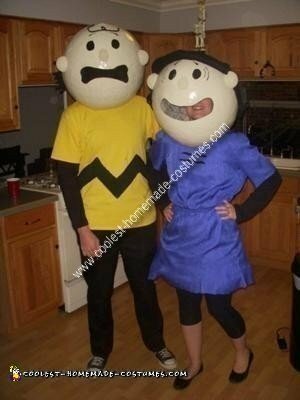 My wife and I decide on a Charlie Brown and Lucy Couple Costume for Halloween. So I started off by going to buy a balloon for the base to make the heads and newspaper for the paper mache. I started by mixing flour and water to make the paste for the paper mache. I ripped the news paper into strips, ripping instead of cutting is better. You have to wait at least 24 hrs for the paper to dry before adding another layer. It took three layers of paper mache for the head to be strong enough. I then painted the heads with spray paint and made the nose and ears out of Styrofoam balls. I cut the mouth out so we could see out of it and covered it with fabric you could see out of. My wife did not like it on hers because she could not see that good with it on. I made Charlie’s hair out of pipe cleaner and Lucy’s out of felt and used pipe cleaners to make it curl up. I painted on the eyes with black paint. I went to a thrift store to find clothes and got really lucky with finding the right color yellow for Charlie’s shirt and found a dress that worked great for Lucy. I painted the zig zag on Charlies shirt with black paint, for Lucy’s dress we had to cut the sleeves off and cut the length down and I used felt for the lines on her shirt. All together this costume took me 3 days to make just because you had to wait in between layers of paper mache. It took about 1 hr or less to put the layers on both heads. I was happy with how the costumes turned out and they were a big hit at the party.